Your entire trip will be luxury travel. India tours will cater to your needs with air travel, luxury air conditioned cars, coaches, buses, and hold your breath, even trains. The trains redefine ‘luxury travel'. 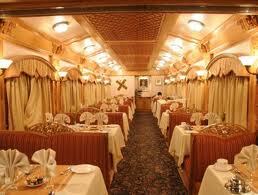 Travel like a Maharaja in the special tourist trains fully air conditioned and fitted for royal travel. You will be pampered in the ultra deluxe trains with richly furnished heritage interiors, delicious cuisine and warm personal service. This is definitely a once in a lifetime's experience. Or glide down tranquil backwaters or sail down India's beautiful rivers, in luxurious houseboats and relish the royal hospitality and regional cuisine. Rajasthan travel can be in comfort and great luxury. Fly to major cities, or motor around in air conditioned cars or coaches. Rajasthan is the only state to have dedicated tourist luxury trains. They start from Delhi and run through most of the major tourist attractions like Bikaner, Udaipur etc. Travel in royal splendor in ultimate luxury. The ultra luxurious Palace on Wheels train tour of 7days starts from Delhi and moves onto Jaipur, Sawai Madhopur, Chittaurgarh, Udaipur, Jaisalmer, Jodhpur, Bharatpur bird sanctuary, Agra and returns to Delhi. The Royal Rajasthan on Wheels 7 night's tour branches out from Jaipur to Kajuraho and Varanasi, returning via Agra to Delhi. New Luxury Train or Heritage on Wheels has two tours. The 4 nights tour starts from Jaipur, chugs along to Bikaner, Haat, Gajner, Black Buck reserve of Tal Chhapar, Ramgarh, Nawalgarh, Mandawa and returns to Jaipur. Another travel packages takes you through the Shekawat region. Or take the 2 day nostalgic tour with the Fairy Queen the oldest working broad gauge locomotive. She will take you from Delhi to Sarisika's tiger reserve, to Alwar and back to Delhi. Latest in travel itineraries of Rajasthan, are the royal Indian wedding travel packages. Get married in traditional Indian royal style , with all its pomp and splendor. Prominent venues are the palace hotels of Udaipur, Jodhpur and Jaisalmer. What a wonderful way to celebrate the most important day of your life. Travel to Kerala for a truly magical vacation. This beautiful state on the south western coast of India lies between the Arabian sea and the lush mountains of the Western Ghats. Travel in comfort either by air, air conditioned cars, buses and coaches or by train in air conditioned coaches. A plus point is that most destinations are easily reachable from one another. Alleppey will give you another aspect of luxury travel. Travel from Alleppey down the intricate network of Kerala's backwaters or in the Kumarakom Lake, in the kettuvallam (tied with ropes) or a luxury houseboat, unique to Kerala. The boat's interiors are the ultimate in luxury, beautiful deck lounges, well furnished lounge and rooms. Attentive personal service, luxurious interiors, fine Kerala cuisine will makes this a favorite mode of luxury travel. India adds its own quintessential touch to traveling in luxury.